Meeting with Federation Council Speaker Valentina Matviyenko. Putin.BLOG Federation Council Meeting with Federation Council Speaker Valentina Matviyenko. 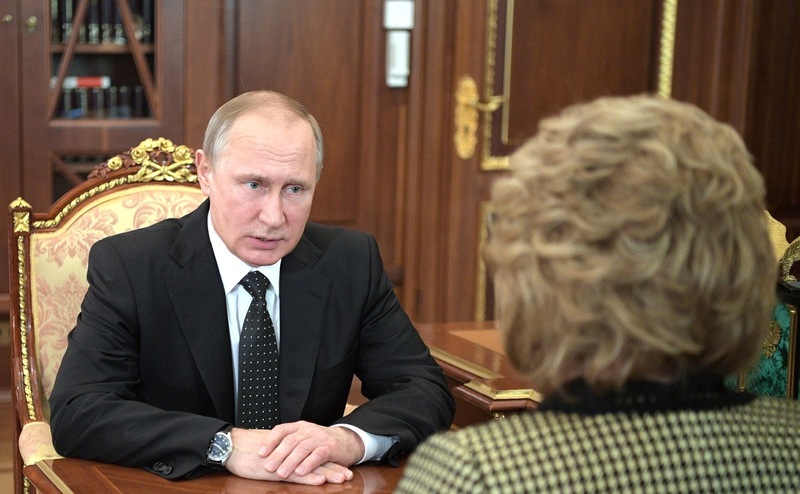 President Putin with Federation Council Speaker Valentina Matviyenko. Ms. Matviyenko, I know that the Federation Council has extended its work until the end of July. Is this because of a large scope of work? Yes, Mr. President. The Government has introduced many important laws that need to be passed during the spring session. We will work for as long as is necessary. Overall, this has been a busy and intensive session. We have been following a good practice on all the important laws, particularly those concerning the regions’ interests. The senators work together with the relevant State Duma committees, putting the draft laws through a ‘zero reading’ when we make our amendments. This is a constructive and useful practice. We also introduce a number a draft laws on our own initiative, acting on proposals from the regions. They include, for example the law on organizing summer holiday activities, following on the instructions you gave after the tragedy to organize safer summer holiday activities. We introduced a draft law prohibiting the sale of anonymous sim-cards, that is, without passport details. The State Duma has backed this law and we will pass it during the spring session. This is an important measure for fighting terrorism. We also introduced a draft law on changes to the electoral system, changes to the law on elections. We analyzed public concerns and on this basis proposed amendments on voting away from one’s place of residence, and other issues so as to make the elections in September and afterwards more transparent, more understandable to people, and prevent abuses. This law has been passed and I am sure that it will contribute to greater liberalization, in the positive sense, of our electoral system. A number of events of public importance have also taken place under the Federation Council’s aegis. There was the International Environmental Forum, which attracted broad international participation. We also held a forum in Crimea, The Great Russian Word, and the International Livadia Forum on the Russian Language and Compatriots Abroad. These events also drew a solid international presence. We held a social innovations forum as well. This was the second such event. The first took place in Omsk. Mr. President, to be honest, I worked in the social sector myself for many years and was quite surprised by just how it is changing. Where did this year’s forum take place? This year’s event was held on Social Sector Workers’ Day in Moscow Region. All of the regions took part and there was a large number of participants, more than 2000 social workers. There was an innovative interactive exhibition where each region presented its latest innovative projects in the social sector, with business participation on a public-private partnership basis or with participation by non-commercial organizations with a social focus. The projects presented completely new facilities and infrastructure, not just what one would imagine – old-fashioned homes for the elderly or children’s homes -, but completely new formats for working with the public and providing services. The exhibition was very modern and interesting. All of the governors said it was very useful as a real opportunity to exchange experience. We also held a meeting of the Coordinating Council for Implementing the National Action Strategy for Children. The meeting focused on summer holidays and recreation. It was a very professional discussion with the regions and with specialists. We hope that summer holiday programs for children will go well this year. There are, however, some adjustments that need to be made to laws and regulations. The Government has finally designated the main ministry responsible, the Education Ministry, and we are working closely together to continue enhancing laws in this area. It would be dangerous to create too much red tape or put forward excessive demands here, because children’s holiday camps are opened not only by state bodies but also by companies, businesses, and we do not want to kill all business desire to work in this sector, which has great social significance. In other words, we are taking all issues into account. I want to thank you for supporting and promulgating the executive order on the Decade of Childhood, because the national strategy document in this area, which was approved five years ago, ends this year. However, in order to continue the efforts to support childhood and families as priority areas of our work, the Government is currently drafting a program that will be updated annually to reflect the matters in this area that are most urgent at the time and what additional protection might be necessary. The regions have welcomed this as a positive step because they can now draft their own regional programs as well. Most important is that the authorities demonstrate that protection of children and families and assistance to children remain top priorities for work over the coming decade. There is also our proposal on a serious matter, which the Prime Minister supports – purchasing medicines for those with orphan diseases. There are not so many such patients in the regions, three here, five or seven there, but when the regions buy these medicines themselves for each individual patient, the costs go up tremendously. You are aware of this issue. We agreed, for example, that medicines for mucopolysaccharidosis, which mostly affects children and is the biggest expenditure item, would be covered by the federal budget starting next year. The Healthcare Ministry will make centralized purchases of medicines. Rather than sending the money out to the regions, it will send the necessary quantities of medicines. Making centralized purchases of larger volumes will reduce substantially the purchase costs. Mr. Medvedev has expressed his support. We are currently preparing the request and the calculations. As this is a budget issue, matters of serious concern to the regions will have to be taken into account in the new budget cycle. Mr. President, we also organized public hearings on a subject that was long ripe for discussion. We simply gave this discussion a formal framework through these hearings on the inadmissibility of interference in Russia’s internal affairs. We know how the US Congress is behaving today. Our action is not some kind of mirror response, but the US Congress has established a special committee to counter Russian influence, this invented threat for which they provide no facts and give no evidence. At the same time, we are getting information from the regions on increasing attempts to influence internal processes in our country. These hearings were very serious and substantial. Intelligence and law enforcement heads presented facts and figures and gave examples. Once again, no one is looking to ban NGOs from working in our country, and our laws prohibit this, but we want to understand how the large amounts of money entering our country are being spent and with what purpose. We know for certain that this is not charity work, humanitarian cooperation or cultural programs. These funds and NGOs are primarily engaged in political activity. No one plans to tighten the screws. We have no such intention. We are studying foreign experience and legislation in this area, including that of the European countries. We have established a Federation Council commission that will serve as a public platform for open discussion of these matters. Let all who think that we are doing something wrong come out and present their proposals. We are not going to work behind closed doors. This will be an open platform for civil society organizations, NGOs, deputies and senators to discuss these issues together. Vladimir Putin with Federation Council Speaker Valentina Matviyenko. 0 Comment to "Meeting with Federation Council Speaker Valentina Matviyenko."